On this page you will find our top picks of the Best Waterproof Golf Shoes. Our Editor’s Choice for the Best Waterproof Golf Shoes goes to the Footjoy Pro SL. The Pro SL’s are incredibly comfortable and have a perimeter weighting outsole that provides exceptional stability, even in the wettest conditions. In a nutshell the Footjoy Pro SL’s are some of the nicest feeling golf shoes you’ll ever put on your feet so if you play a lot of golf then look no further. The Fine Tuned Foam (FTF) has supple cushioning that moulds the shape of your foot providing even more comfort over time. The outsole has perimeter weighting which adds exceptional stability and balance throughout your swing, even in torrential rain conditions. The ChromoSkin™ leather (by Pittards® of England) is super light in terms of weight and durable adding to the overall comfort and robustness of this shoe. At the price, Footjoy have certainly dished up great value for you here. Only one set of white laces that match the shoe whereas the BOA style doubles up the laces – still not a deciding factor though, most of us are used to only one set of laces for a pair of shoes! 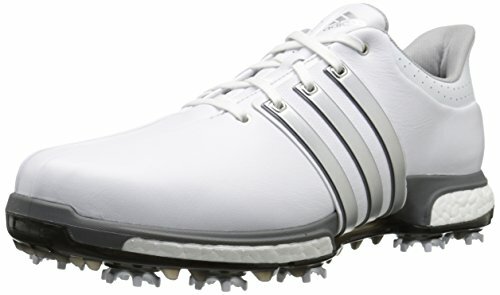 We have been Adidas golf shoe fans for many years now. The Tour 360 Boost is undoubtedly one of their most comfortable and sporty shoe offering, yet they still have a classy look about them. The FitFoam and 360 Wrap mould so well to your feet making it feel as though you are donning your most comfortable pair of sneakers. Although the Tour 360 Boost’s are slightly heavier than other shoes in our list, we think they offer the best value for money in terms of waterproof shoes. Under Armour have provided a world class golf shoe with the help of superstar Jordan Spieth – and named the shoe after him too. Undoubtedly it is a busy golf shoe and perhaps not to everyone’s style, but Under Armour have delivered phenomenal comfort and support. When looking at the sole you’ll see a slightly alternative cleat layout with a number of cleats as far to the outskirts as possible – especially towards the front of the shoe. This has been built to rotate with your swing and subsequently aid your performance even from the trickiest lies or wettest conditions. The alignment lines on the inside of the upper are also an interesting feature – although there are no guarantees that they work, it’s still a nice touch. They are fairly pricey and a bit more than some of the competitors, but it is a very solid golf shoe and well worth giving them a bash. You’ll be very pleasantly surprised at both the comfort, stability and overall aesthetic look. Footjoy has been in the game longer than anyone else and all golfers will know just how good they are. The D.N.A is a classy, but conventional looking shoe with a modern twist that a number of the world’s best players are wearing such as Adam Scott. The ChromoSkin™ leather, developed by Pittards® of England is beautifully soft, but most importantly durable and lightweight – not to mention it’s fantastic full waterproof quality. Traction is superb primarily due to the tornado cleats by SoftSpikes and the low profile sole aid in top notch performance. 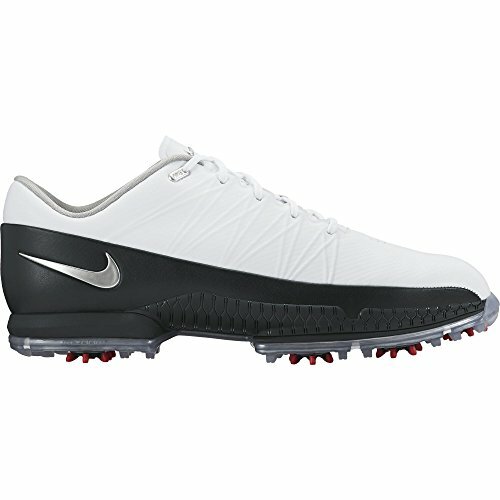 Nike have made a big move in the golf industry and whilst most of their golf shoes have the running/trainer shoe look, the Air Zoom Attack look like proper golf shoes, but with such a funky and classy aura about them. These shoes just look expensive and are the business! Lightweight shoe that offers tremendous stability right through the swing. 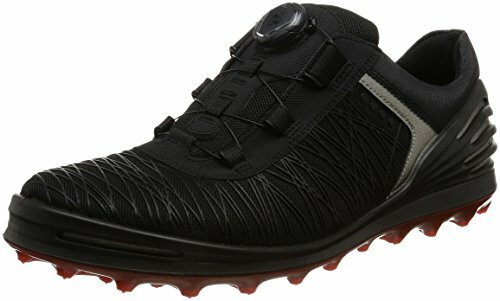 Ecco are known for their spikeless golf shoes, but the Cage is not spikeless. 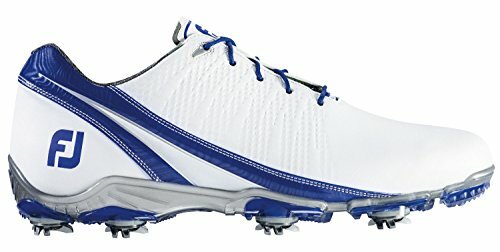 Ecco made this shoe for the player who actually enjoys wearing soft spikes. Having always been known for their comfort, they are not always known for their shoes being the epitome of style. I have actually tested these shoes though and was quite surprised when coming off the course just how easy they were to play in. Ease and grace. Don’t you immediately just think of Rickie Fowler?? Unreal how a brand and player are synonymous. Fantastic style and construction offering players of all caliber premium comfort and class. 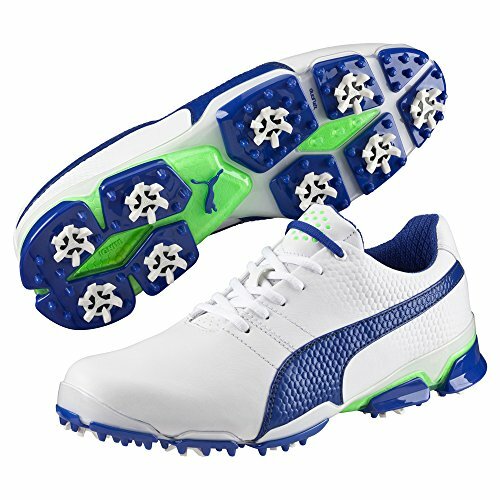 According to Puma the TitanTour offers proprietary foam cushioning providing golfers with extreme comfort, responsive energy return and stability throughout your golf swing. They also feature a full grain upper leather made of the highest quality and paired up with the heavy guage thread provide long lasting quality. Your feet will stay dry in these shoes due to the Outlast Insole that wicks away moisture regulating temperature. We’re racking our brain here, but we can’t find a negative. 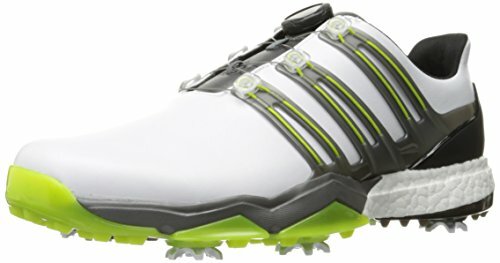 Just a quality golf shoe! According to Adidas, the new Powerband BOA Boost maximizes support, balance and traction maximizing their swing potential. The Boost technology Adidas uses is situated in the midsole and provides superb comfort and energy transfer. This has been prevalent in a number of Adidas new shoes and is a fantastic feature. The BOA closure system replaces traditional laces and is situated on the tongue of the shoe with a push/pull closure system. Adidas believes this adds more stability and allows golfers to make micro closures on the fly during a round. Conveniently and efficiently I’d say. Available in a fair few color options the Powerband BOA Boost has a bold look about it and certainly isn’t popular among all golfers. But there are masses of golfers who love them. Middle of the line in terms of price & value, but if you prefer a sportier look then these have your name on them. Ok we’ll be honest – looks wise these aren’t our favorite, but that’s not the discussion here. Nike have traded the traditional spikes for a new system called Articulated Integration Traction. Basically no need to replace spikes anymore, the sole has plenty of traction and grip! The Lunar Vapor are hugely flexible, but without sacrificing comfort and another point to mention is how lightweight they are. If you prefer more of a ‘sporty’ look to a golf shoe and general style then these are for you. Available in 5 colors and decent value. At first glance you don’t associate Skechers with golf, but they are starting to solidify their name in the golf shoe niche. Brand ambassador Matt Kuchar has been wearing them for a while now and swears by them. A classic design that offers Skechers’ H2GO Shield Waterproof protection. The dynamic traction plate also offers wonderful grip for such a thin soled shoe. 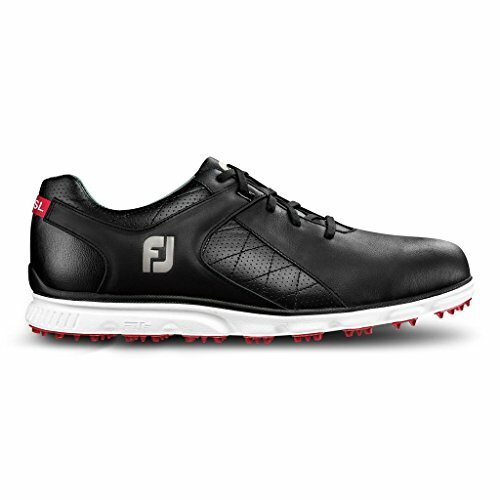 Again like the Footjoy Pro/SL, these offer good comfort if you play a lot of golf. You’ll feel as though you’re wearing actual sneakers whilst out on the golf course smelling the roses walking the fairways. There are many factors to consider when purchasing a new pair of golf shoes. Comfort, feel, look, durability, build quality and waterproof characteristics are just few that pop to mind. The latter is a key consideration. Like it or not, you will inevitably be playing a few rounds every year in rain. Here is a quick buyers guide to help you find the best waterproof golf shoes. Let’s call a spade a spade. If the shoes don’t fit you well and aren’t exceptionally comfortable on your feet from the first time you try them on then put a line through them! Move onto the next potential option available. Bear in mind you generally are walking each round and not riding so that works out to be being roughly 6 miles. SIX MILES! Don’t make it harder than it already is by having uncomfortable shoes. If you have a certain brand that you know fit you ‘like a glove’ then stick with that brand. Perhaps just opt for a different style within that brand and this will make it easier for you to follow through on those online impulse buys where you are doubting certain things. If you’re trying out a different brand then I suggest you try these shoes on at your local golf store first and then purchase through one of our affiliates that offer fantastic prices. It is exceptionally important to pay attention to the sole of the golf shoe and just how detailed the cleat or spike system is. Bear in mind you will find yourself hitting golf shots from a number of different lies and slopes and you need to maintain balance. And balance is derived from the grip you have from the bottom of your shoe to the ground. Some shoe manufacturers have chosen to position spikes towards the exterior of the shoe in order to add grip and stability whereas other manufacturers have chosen to do away with replaceable cleats and rather build their own sole traction system. The shoe needs to have enough flexibility to the sole in order to ‘mould’ your foot’s position on slopes and through parts of the golf swing. You don’t want to feel on your downswing as if the shoe has a concrete sole and limits flexibility! It needs to bend and flex whilst still supporting your feet right through to your follow through. There is a huge amount that goes into building a quality shoe – especially waterproof golf shoes. 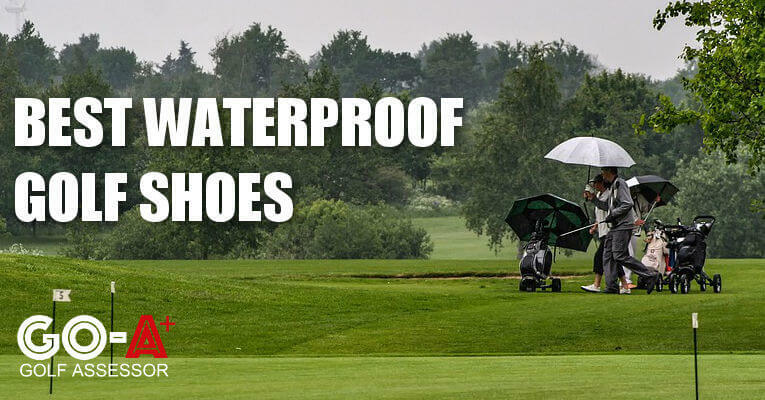 Waterproof shoes are more expensive because they protect your feet from getting soaked during a round in wet conditions. 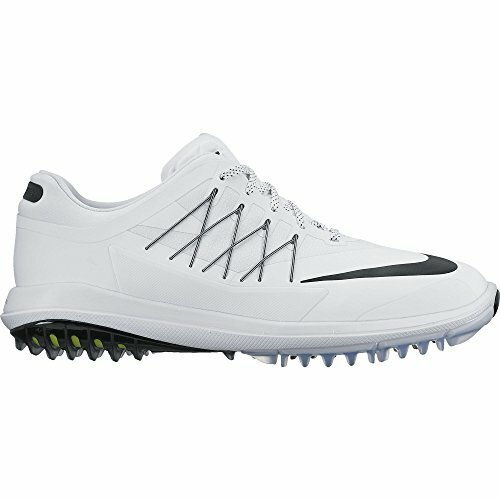 Besides the waterproof aspect, many manufacturers nowadays (especially Nike) are trying to make the shoe as lightweight as possible for you so that you get more enjoyment out of a round of golf. Speaking from experience, a heavy shoe is terrible and really starts taking it’s toll toward the end of the round. This also makes it easier for you to lose concentration and finish off poorly. Pay attention to the build quality of a shoe and inspect all elements from the leather to the lightweight elements over the shoe to the laces to the sole. All play a part in comfort and performance. Sometimes you find a bargain that you just can’t pass up, but on golf shoes it’s tough to find. At the end of the day waterproof golf shoes are expensive, but you need to keep in mind how long they are going to last you for. If you are a super keen golfer you might be playing upwards of 100 times a year. If you’re a regular golfer you can trim that to maybe 50 times a year. That means for regular golfers a great pair of waterproof golf shoes that cost you $200.00 at the time will last you roughly two years and prove to be great value. Unlike a cheaper alternative that cracks or the sole comes loose and you’re purchasing a new pair after 6 months. 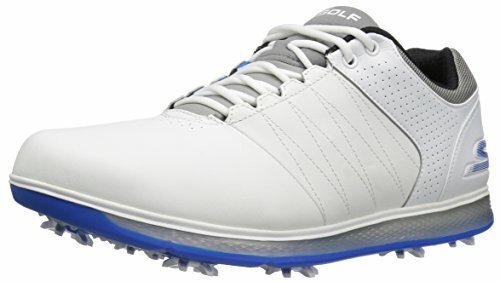 We hope our best waterproof shoes for golf review has helped you make an informed choice on the right waterproof golf shoe for your game, but if you still have questions just leave a comment below and we will reply within 24 hours. I moved away from golf shoes to wearing shoes with a flexible sole in order that my foot and shoe would flex together. Shoe manufacturers have filled the shoe with a sponge like product which squishes as the foot moves and absorbs the movement. The problem with that is the sponge cover soon wears through especially at the heel then the sponge disintegrates often revealing a stitched seam or a hard insert designed to hold the outer fabric upright. Do you check the soles for flexibility? As for fit the outer material of the shoe should be shaped to fit the foot not just be a random shape filled with spongy material to give the feeling of a good fit.